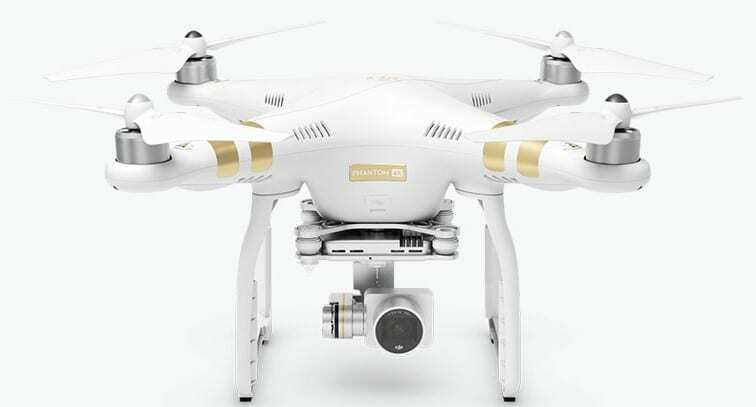 DJI Phantom 3 4K is a drone or quadcopter that is built for those interested in aerial photography and film-making. As its name suggests, it is capable of stunning 4K video recording. The DJI Phantom 3 4K offers you 4K video just like the Phantom 3 Professional, but comes at a more affordable price. The Phantom 3 4K is fitted with a robust, Sony-made 12-megapixel camera. The shooter is attached to a gimbal with 3-axis (pitch, roll, and yaw) stabilization and a pitch controllable range of -90 degrees to +30 degrees. It can be used to record up to 4K UHD (4096 x 2160pixel) videos. The camera uses a nine-element lens having an f/2.8 aperture. With a 94-degree angle-of-view, the lens has a narrower angle than that of a fisheye to ensure less distortion while still providing sufficient image width. DJI Phantom 3 4K can be used to capture still images (JPEG and DNG RAW) at up to 12 megapixels in single-shot or burst-shot mode. In addition to ability to record media to a microSD card, the Phantom 3 4K is designed, like most other drones in its maker’s popular Phantom series, to enable users view live video and image recording. A Wi-Fi extender with an operating frequency between 2.400 GHz and 2.483 GHz built into the quadcopter’s controller or transmitter extends the wireless connection range as high as 3900′ line-of-sight. The live video feed or recording is viewed on a smartphone using the DJI Go app. You can also control the camera on the Phantom 3 4K using this app, which is available for Android and iOS devices. DJI Phantom 3 4K has several flight control modes, such as Home Lock, Waypoints, Point of Interest (POI) and Follow Me, to enhance its usefulness. Home Lock lets you configure controls relative to the Home Point (point of takeoff) so that you can control the quadcopter to return home or fly farther away more easily. The Waypoints feature allows you define the course of this aircraft as well as speed, attitude and heading at each waypoint. The DJI Phantom 3 4K drone is equipped with an intelligent flight battery of 57W capacity. The unit has on/off switch and four LED lights that can be seen from the ground to enable you order DJI Phantom 3 4K to return before the juicer goes flat.